The Novena begins by reciting the official prayers of the Novena in honor of Our Sorrowful Mother. O most blessed Virgin, Queen of Martyrs, you stood generously beneath the cross and felt the sword of sorrow pierce your soul. Look now with a mother’s understanding and tenderness, as I kneel before you to commemorate your sorrows, and to present my petition to you with childlike confidence. I beg of you, O Mother, to plead for me with your Son, so to touch his Sacred Heart, that I may obtain my request… (here pause to make your request)… For to whom shall I turn in my time of need, if not to you, O Mother of Mercy, who having so deeply drunk the chalice of your Son, can surely tell Him of my needs. Amen. O Mary, my sweet mother, you witnessed the death of your Son on the cross. Intercede for me at the hour of my death. Be my comfort at that hour. Ask your Son to grant, in His infinite mercy, that I may die saying with my last breath: “Jesus, Mary, and Joseph, I give you my heart and my soul.” Amen. Queen of Martyrs and Mother of Consolation, you felt the sword of sorrow when your Son Jesus was raised upon the cross. Pray for these sick persons… (here pause to make your request) … that they may by your powerful intercession be cured of their illness, and thus we may both in time and eternity give you heartfelt thanks. Amen. O most Blessed Virgin Mary, my dear mother, I turn to you in prayer, and beseech your help for the holy souls who have gone before us marked with the sign of faith, particularly those for whom we now pray… (here pause to make your request)… Mother of Sorrows, for the love of your Divine Son, whose precious blood was shed for us, pray for our beloved dead, and pray for us now and at the hour of our death. Amen. Holy Mary, Mother of God and Queen of Martyrs, I do this day choose you as my model, protectress, and advocate. Receive me as your special servant, as a partaker in your sufferings. Give me strength always to remain close to Jesus your Son who died on the cross for me. Accept every good work that I may perform and offer it to your Son for me. Dear Mother, stand by me in all my actions, that they may be directed to the glory of God. Amen. O Mother of Sorrows, how ungrateful have I been in the past to my loving God. Now, I repent, humbly asking pardon for the offence done to God in His infinite goodness, and I resolve by the help of His grace to offend Him no more. Obtain for me that I may live and die in the love of my Lord and share eternally in that glory which He has won for me through His death and resurrection. Amen. Her heart filled with joy, Mary presents her Son Jesus in the temple. Simeon accepts Him in his arms and utters his harsh prophecy: “This Child is destined to be the downfall and the rise of many in Israel, a sign that will be opposed — and you yourself shall be pierced with a sword — so that the thoughts of many hearts may be laid bare.” Consider how we so often neglect Christ and His mother as we forget their sufferings for us. Holy Mary, you know better than anyone that those who love much will suffer much. Simeon’s prophecy let you see the cruel reception that some would give to your Son’s message of love and justice. In our day, we can hardly fail to worry about the clouds of uncertainty that hang over our life and to be anxious about those we love. The future sometimes frightens us. When we are discouraged or afraid, share with us your confidence in the words of the angel Gabriel: “Nothing Is impossible with God.” Amen. Hail Mary, full of grace, etc. Many of us are parents. We know that life can be deep and beautiful. That is why we joyfully present our children for Baptism. Only by sharing life with God is life fulfilled. We know the joy of presenting a baby to God, but we often sense a strange fear about the future of those we love. 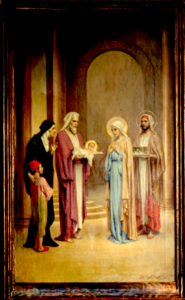 Simeon’s prophecy was a blessing for all humankind, but foretold grief and pain for you, Mary. Your first sorrow was much more than a parent’s fear. Our future and the future of those we love is unknown to us. Mary, help us to live with our fear about the future and trust God who can lighten even our darkest fears. Amen. 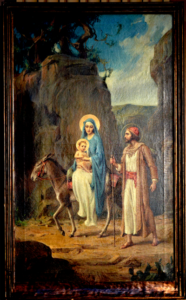 With Joseph and her Child, Mary must flee into Egypt. She endures the hardships of a long journey and becomes a stranger in a strange land in order to protect her Divine Son from those who would destroy Him. How often sin drives Christ from our hearts, but His absence leaves us cold and indifferent. Holy Mary, you learned through the message of an angel how precious was the life within you. Later, at the message of another angel, you fled with Joseph to a foreign land to defend that precious gift of life. Holy Mother of God, the forces that threatened the life of the Infant God still abound today. Whenever a child is abused or abandoned, an elderly person neglected, or an immigrant unfairly treated, that is really Jesus who is abused or neglected or unjustly treated. Yet we know from your example that we can take action to protect life. Your willingness to face change in your life for the sake of the kingdom of God calls us to change our lives so as to rid ourselves of sinful habits, to show greater respect for the sift of life, and to offer hospitality to the stranger and the exile. Amen. What can a mother do when the life of her son is threatened? When Herod decreed death for all those innocent children, God warned Joseph. With no time for packing or goodbyes, you escaped into the night. Homeless, tired, and hungry, with memories of home and family and an uncertain future before you, you were secure in nothing but the love of those who needed you. Mary, teach us the secret of survival when we are torn from what we understand and love. Though we are descendants of immigrants, it has never been easy to grow in foreign soil. Teach us to endure and abide in peace. Teach us to overcome our insecurities through patience and love. Amen. Holy Mary, our hearts are often divided, our lives distracted as we seek after many things. Sometimes we hardly know what we are seeking, with so many voices calling us in so many directions. Your every desire, most holy mother, was to do God’s will in all things. You Son has promised that those who seek first the Kingdom of God will be given all things besides. Help us to turn our hopes and desires more fully to God. Give us that same sense of urgency you had to repair broken relationships and to live in unity with all of God’s creation. Enable us to be peacemakers when anger or stubbornness threatens to divide our family. Through the power of the Spirit dwelling within us, may we be constant in prayer; and may the promises made to the pure of heart be ours. Amen. A child is lost. What panic grips the hearts of parents at such a time? They wonder, “Is he safe?” and then they imagine things too terrible to express. It was the same for you and Joseph, Mary. For three days you sought Jesus. It took faith to continue the search in the pain of separation. Mary, Mother of Jesus, we have been separated from our loved ones. Sometimes there are accidents of time and place, and sometimes our own carelessness or selfishness gets in the way of reunion. Console us in our loss, but help us to persist in searching for love that is lost or hidden. Amen. This is the first Good Friday, and the Son of Man is condemned to crucifixion. 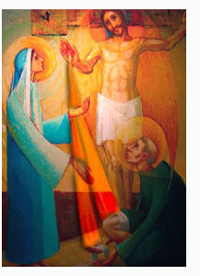 As He makes His painful way to Calvary He meets His mother. Mary sees her Son bruised, derided, cursed, deified, and her heart almost breaks as she follows Him to sure death. 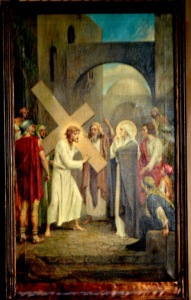 Whenever I sin I too scoff at Jesus Christ and add weight to His Cross and to the sorrows of His mother. Although many followers of Jesus fled at the first sign of trouble, you chose to remain and share His pain, most faithful Virgin. You were willing to follow your Son wherever He went, even to His place of crucifixion. How terrible to be part of such a public spectacle, to hear the jeers and taunts of the crowd, to find yourself helpless against the false accusations of the mighty and the powerful. Often we want to flee the cross and avoid those who are suffering today. Help us, most courageous woman, to overcome our fear of suffering and help us accept the fact that faithfulness to Jesus means that what we say and do many not always be popular. Amen. What mother called suddenly to the hospital to see her sick or injured child has not wished: “If only I could suffer instead of you!” No matter what a mother wishes, the child continues to suffer, and she becomes a spectator. Mary, you saw Jesus beaten and bloody. You felt so powerless to help Him and yet through your love you shared His pain. Teach us to believe in the power of love, Mary. Whenever we feel trapped and useless, unable to say or do anything to relieve one who suffers or fails, allow us to quietly continue to love; for love never fails where all else does. Amen. The passion reaches its climax. 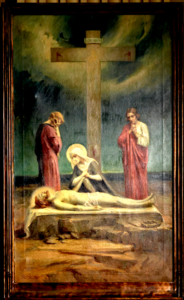 Mary stands near her dying Son unable even to touch Him. She hears Him sob “I thirst” and is helpless to minister to Him. He promises heaven to a thief and forgives His enemies. 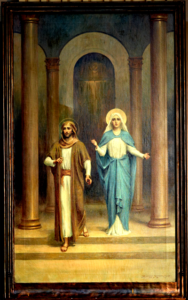 His last words directed to us center on His own mother, “Behold your mother.” Let us resolve always to look upon Mary as our mother and remember that a mother never fails her child. Holy Mary, how hard it is to watch a loved one suffer and the; yet you remained at the foot of the cross for three long hours. Then, as you were losing everything that mattered to you, you agreed to become our mother. It seems impossible to imagine that in your darkest hour of grief you would take on more responsibility, as mother to all the wandering children of Eve – we who so often ignore the teaching and example of your Son. How great is your love for us! 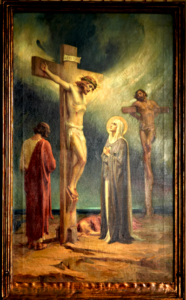 Teach us, loving mother, to stand with you beneath the crosses of those who suffer today. Even when we can do so little and want to do so much, let us know that our simple presence to those who suffer is a sign of love and a great act of worship to our most forgiving Father. Amen. It has often been said “To lose a child is the worst death for a parent to endure.” Mary, in those long hours before the cross, watching Jesus the, perhaps your thoughts returned to Bethlehem, Nazareth or Egypt when He spoke His first word or took His first steps. Or perhaps you remembered searching for Him in Jerusalem or hearing Him preach or helping that young couple at Cana. How horrible it was to face the reality of death! His strength failed, His breath grew labored. The time had come. And yet He spoke to you and consoled you. In His dying He gave life to all, and made you the mother of all people. Calvary was the “sign of contradiction” foretold by Simeon. There, birth came to the world through death, and motherhood in the loss of an Only Son. A shadow pierced your heart to reveal the spark of a promise yet to be fulfilled — of sorrow turned to joy. Mary, teach us to wait in darkness for the light. Amen. 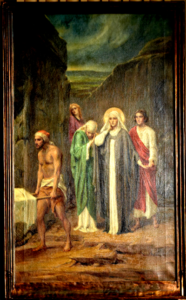 From the lips of Jesus comes the bitter complaint, “My God, My God, why hast thou forsaken me?” and the final pronouncement, “It is finished.” His passion and death are over, but His Mother dies a thousand deaths when she holds His Body in her arms and relives those three long hours of torture. So great was Mary’s love for her Son that we will never fully appreciate her sorrows, but we can sympathize with her in her grief. Holy Mary, as we gaze upon your serenity as you hold the dead body of your Son in your arms, you give us new hope when our life seems hopeless. Even when it looked as if all were lost, you continued to believe that the promises God had made long ago would be fulfilled. You knew that somehow, some way, God would bring something wonderful out of the darkest moment in human history. Mary, when we must face death ourselves, may we have that same sense of resignation that we see in you, confident that we are simply passing to a greater joy and a greater love. Amen. Mary, a poet once said: “Each man’s death diminishes me.” We know how true it is each time a loved friend or relative dies. We will know death many times before we die. Help us to accept death as a necessity of life. Amen. The most tragic day in history ends, and all that is left for the Mother is to accompany her Son’s body to the grave. For the last time she looks upon her Son and in remembrance her grief knows no bounds. She remains alone, the last of the Holy Family. Certainly, we who know the meaning of suffering can mourn with Mary in her great sorrow. Loving Mother, as you handed over the body of your Son to be buried, you were allowing God’s plan of salvation to continue with the resurrection on Easter morning. Death to self and sin remains the only road to eternal life; but we are so slow to learn from your example, so hesitant to trust in God’s love. How often do we try to control the actions of God! How impatient and anxious are we when what we think ought to happen does not happen! How frequently do we hold on to what little we have for fear that we will be left with nothing! Mary, your time of suffering is now over and your joy complete. Yet we see how the world still groans and is in agony waiting for the fullness of salvation. Help us to continue to work and pray for a more just world. May no more mothers know the grief that you knew. Amen. The Garden and the Tomb. There is something strangely consoling about the burial of Jesus, Mary. As your Son was laid to rest, perhaps in the garden, a flower or blade of grass recalled how He assured His disciples, “That unless a seed falls to the ground and dies, it cannot produce new life.” Those were His thoughts. It is always difficult to see death and life together, but you continued to believe, to hope, and to love. His words filled your heart. Mary, help us to understand how those who “sow in tears can reap rejoicing.” Help us to believe that the death of Jesus is the seed of everlasting life. Help us to hear His word, and accept the swords of life and the cross of death in our lives, so that we may share in the resurrection and life of your Son, Christ, our Lord. Amen. On this eighth day of the Novena, let us stand together with St. Peregrine and the Sorrowful Mother and pray a blessing for the sick and suffering. Our help is in the name of the Lord who alone made heaven and earth. O Lord, hear my prayer and let my cry come to you. Lord and Father, almighty and eternal God, by your blessing You give us strength and support in our frailty: turn with kindness toward your suffering servants. Free them from all illness and restore them to health, so that in the sure knowledge of your goodness, they will gratefully bless your Holy Name. May Our Lord Jesus Christ be with us that He may defend us: be within us that He may preserve us; precede us that He may guide us; follow us that He may guard us; be over us that He may bless us: for He lives and reigns with the Father and the Holy Spirit forever and ever. Amen. May the blessing of Almighty God., Father, Son, and Holy Spirit, descend upon us and remain forever. Amen. Remember, O most gracious Virgin Mary, that never was it known that anyone who fled to your protection, implored, your help, and sought your intercession, was left unaided. Inspired with this confidence, I fly unto you, O Virgin of virgins, My Mother. To you I come; before you I stand sinful and sorrowful. O Mother of the Word Incarnate, despise not my petitions, but in your mercy hear and answer me. Amen. – Christ graciously hear us. Mother of the pierced heart, pray for us. Mother of the Redeemer, pray for us. Mother of the redeemed, pray for us. Mother of all the living, pray for us. Mother of disciples, pray for us. Obedient Virgin, pray for us. Prayerful Virgin, pray for us. Virgin of silence, pray for us. Virgin of forgiveness, pray for us. Virgin of contemplation, pray for us. Woman of exile, pray for us. Woman of strength, pray for us. Woman of courage, pray for us. Woman of sorrow, pray for us. Woman of the new covenant, pray for us. 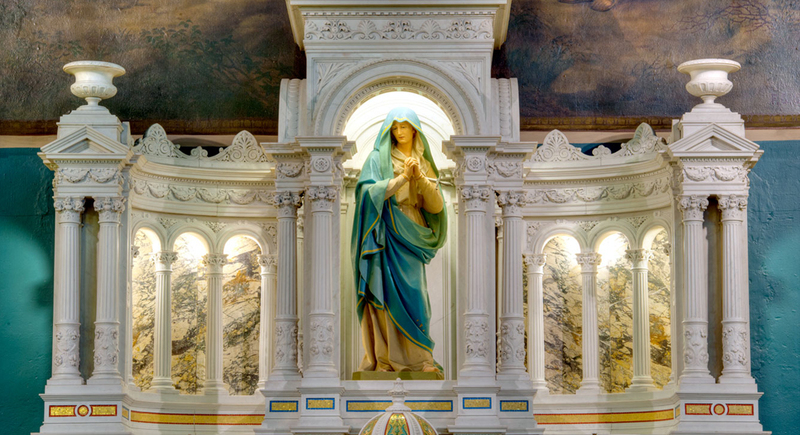 Woman of hope, pray for us. New Eve, pray for us. Disciple of the Redeemer, pray for us. Servant of reconciliation, pray for us. Defense of the innocent, pray for us. Courage of the persecuted, pray for us. Strength of the oppressed, pray for us. Hope of sinners, pray for us. Consolation of the afflicted, pray for us. Refuge of the poor, pray for us. Comfort of exiles, pray for us. Support of the weak, pray for us. Relief of the sick, pray for us. Glory of the Church, pray for us. Virgin of Easter, pray for us. Lamb of God, you take away the sins of the world: forgive us, Lord. Lamb of God, you take away the sins of the world: hear us. Lord. O God, you willed that the life of the Blessed Virgin be marked by the mystery of suffering. Grant that we journey with her on the way of faith and unite our sufferings to the passion of Christ so that they become occasions of grace and the promise of future resurrection. We ask this through Christ our Lord. May the Virgin Mary protect us and lead us kindly on life’s journey.